Smartcard News Blog: Is making Payments on the Internet Safe and Secure? Is making Payments on the Internet Safe and Secure? I couldn't help but chuckle reading in the paper today about the unemployed lorry driver who sold the Ritz hotel in London for £250 million when it's worth two or three times that price. He was so successful that he even managed to get £1 million popped into his bank account before the fraud was discovered. Remember the old saying that if it sounds too good to be true it probably isn't so good! You can't help wonder about the people who are duped by such offers, are they not perhaps just as dishonest as the fraudster in thinking they can make a quick buck to somebody's disadvantage. So how does this work in the antiques trade? If I pop into a shop with an old plate from mother's collection and get offered £300 to hear later that it was worth £100,000 who is wrong? Is an antique dealer obliged to pay the potential market value for which of course he is on risk? He might have made a mistake or an expert further down the road might throw it out as a copy. How would you mark his reputation? Arguably you could say he is paying you what it is worth to him at that moment in time, is he obliged to tell you it might be worth £100K? And what happens if you are an expert and see some artefact in a shop marked up for $50 that you know is worth $50,000, should you tell the shop keeper about his error? Perhaps I'll cause an uproar here but it seems to me that many antique collectors are out to discover just such an opportunity. So down to basics, what happens if you get given a £1 coin that you subsequently discover is a counterfeit? 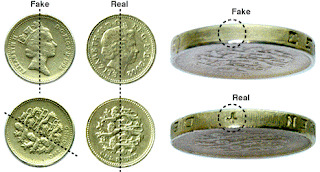 We have been hearing this month that 1 in 36 £1 coins in circulation are counterfeit. Now I'm sure you all know that as soon as a coin accepted in good faith is found to be counterfeit, it is immediately rendered worthless. Attempting to pass it on is an offence. I'm sure we all hand our counterfeit coins in to the bank so that they are taken out of circulation. I still remember as a youngster getting foreign coins in change and not being too excited about it when discovered. Not me of course but some of my friends developed an art for passing them on undetected to the next person. Now I'm not setting out to cause any unnecessary guilt complexes but only want to raise some fundamental issues of today’s society and it's all about reputation and trust which are closely related. So in our previous scenarios do we trust antique dealers and what is their average reputation? Of course they are going to differ but how can I tell the reputation of a particular individual? Now imagine the same antique dealer going to his bank for a loan, can the bank trust him (or her)? The basis of trust and reputation are really quite different, you could be very good at spotting a bargain making large profits but particularly bad at repaying loans. So the bank is only interested in your reputation in that one area and that's not straightforward because your reputation can change overnight, an unforeseen event perhaps (maybe somebody has defrauded you) and you can no longer pay your bills. You may be wondering where all this is leading, well dear subscribers lets enter the wild, wild, West or to put it another way the internet. Here the system of reputation and trust is even more on trial. Last week a friend was telling me about her experiences on an on-line dating site, she met up with a great guy and they seemed to have so much in common and then out of the blue came the call for money. The details don't matter but this is really common and many innocent people are robbed of all their savings. We all do it, yes, eBay can be great fun and you can get some bargains but this really is the haven for every fraudulent idea ever invented by man and there are new ones occurring every day. So how do you pay for your purchases? PayPal of course, in most cases at least but this doesn't stop you from getting involved in fraud whether the seller or the purchaser. The goods were never sent or never arrived give me my money back depending on which party is the fraudster. Disputes like this are legion and it's not too difficult to get your PayPal account frozen and it's often very difficult to get it released. So the question I'd like to leave you with this month is when making payments on the internet who do you trust and what will your bank or PayPal do in the event of a dispute. Do we need a better way to pay? Is Your Password Easily Accessible?